Pearls became accessible to regular people when we discovered the marvelous way of creating cultured pearls. Even though their symbolism might have gotten lost along the way (some societies associated pearls with magic), their use in jewelry pieces has become a tradition that no one is yet ready to forget. It comes as no surprise that a black pearl ring has become a sophisticated accessory for the modern woman. We often wonder what makes pearls such unique gemstones and the answer is pretty simple: unlike other gems, pearls are retrieved from the depths of the sea, not of the earth. They do not require special polishing to maximize their luster, being close to perfection from the very beginning. Their beauty has been treasured since ancient times, pearls being used in jewelry at least since ancient Greece. They were considered so valuable that, in the Byzantine Empire, the rules allowed only the emperor to wear pearls. This beautiful ring’s pearl has a 9.0-9.5 mm diameter, so this is one jewelry piece that will certainly not go unnoticed. You might wear it during your birthday party, to show your guests the stunning gift you received, or during any party for that matter. Although this is a classy ring and should be matched with an elegant outfit, do not be afraid to experiment and bend the rules. Everyone should know by now that the only natural black pearls are the Tahitian ones. When it comes to black pearl engagement rings, the AAAA luster of this beautiful pearl will catch your eye from the beginning and you will enjoy wearing such an elegantly shaped ring, with an 8-9 mm diameter pearl. Sitting high atop the 14k white gold ring, the black pearl displays a touch of class and gracefulness that is rarely found in a ring. Each side of the ring features diamond accents, so the glimmer of your ring will go perfectly with every dress or tailor made suit you wear. What can look better than a South Sea black pearl on top of a white gold band with diamonds? This ring is perfect to be worn on every occasions, be it a family holiday or a reunion with your friends at a fancy restaurant. You do not even need other jewelry pieces, lose the necklace and the bracelet, they will only fade away in comparison to your gorgeous ring. This chic piece blends two elements in a very gracious manner, the design of the 14K white gold ring displaying a smooth and round black pearl, with gorgeous little diamonds on the partially opened sides. This is the proper choice if you are going to a cocktail party, where you want to look a million dollars. Pearls compliment almost any elegant outfit and black pearl rings are particularly fashionable. If your boyfriend shows up at your door with this wonderful piece, consisting of three 18K gold rings, on top of which there is a shell encrusted with diamonds, hiding a beautiful black pearl, then you can rest assured, the man you are getting married to has incredibly good taste. This ring speaks for itself, it is a token of craftsmanship that can rarely be achieved. And imagine how perfect you will look on your wedding day, wearing this on your hand! The style of this ring can only point to the glamour of the wearer: with a 14K white gold band, 5 encrusted diamonds and a black pearl with almost perfect shape and luster, this item is a fashion statement. This is the ideal choice for parties and gatherings where you are required to wear high class outfits. You do not have to give up on your pearls not even on days you wear casual outfits. This black mother of pearl ring gives you a vintage vibe and you will feel everyone’s eyes on you, especially if you decide to wear it at work or to a simple gathering. Either way, this is a very special piece that deserves all your attention, as it could very well become a family jewel. These are not the only option from which you can choose, any Tahitian black pearl ring has a special and unique touch, you just have to find the right one for you. 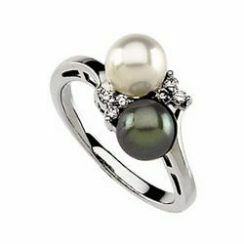 A black and white pearl ring is also a great choice if you like combining two different colors on the same jewel. The advantage of wearing a black pearls ring is that you will look sophisticated and contemporary at the same time, which means this is a gem that you can wear to the office, for evening engagements and even for your everyday attire. You might even try your luck wearing one at a job interview, your neat and classy appearance will certainly make a good impression. Black pearl rings make great gifts too, that is why a lot of men choose to offer their loved ones such jewels. If you have in your jewelry box such a ring or you are planning on getting one for yourself, treat it with care, whether the black color of the pearl is acquired through natural means or through „French dying.” Although it is an artificial nuance, it will last longer than the natural one, but you need to keep in mind that these are real cultured pearls so they need the same careful maintenance as the naturally colored ones. These being said, you are now familiar with most of the options, so take your time and pick whichever black pearl ring you think will look best on your hand. It will be a lasting piece of jewelry!